Fluorescent - Geranium psilostemon - Bright electric pink blooms with black star shaped centers make a great show against deeply lobed dark green foliage. Growth habit is tall, forming a large clump. Blooms over a long period. Height: 36in. 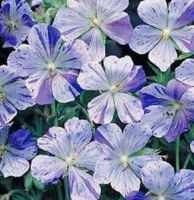 Splish Splash - Geranium sanguineum - Perennial; Pink to lavender blooms splashed with purple. Nice bedding plant, with a spreading habit. Hardy to -40F (-40C); height: 16in.